Knit for Peace’s main work is to get donated knitting to those in need. With an estimated over one million items distributed a year (and increasing), we are finding that acknowledging, sorting, storing, dispatching and delivering costs a lot. We rely heavily on volunteers so costs are kept down. At the moment our parent charity, the Charities Advisory Trust, is meeting these costs from reserves, but this isn’t sustainable. That’s why we ask for funds. We quite understand that you wonderful knitters are paying for the yarn and delivery of your items as well as giving your time to make beautiful warm knits for those in need. But if you can spare some funds, or organise a fundraising event, it will help to keep Knit for Peace going. 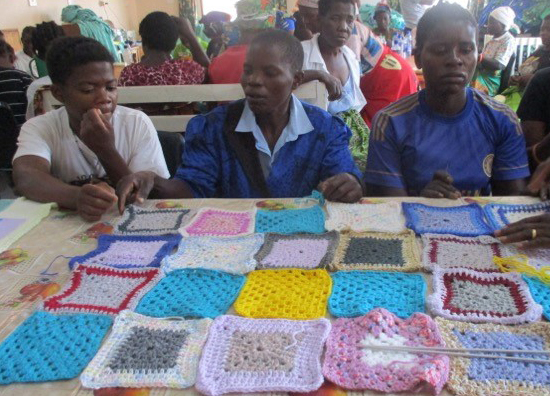 – We send knitted squares to women recovering from fistula operations so they can knit them together to make blankets to take home.